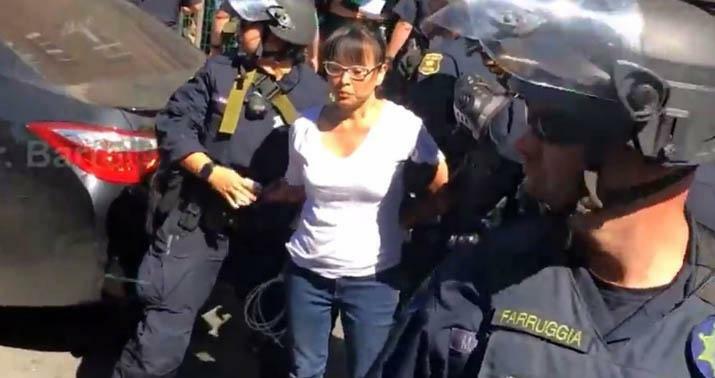 Yvette Felarca is a leader of a Berkeley area Antifa group called By Any Means Necessary (BAMN). July 2017 Felarca was arrested on charges of inciting a riot and felony assault over an incident that took place in Sacramento in 2016. In February, Felarca and two other Antifa defendants asked a judge to dismiss the charges on the grounds that she is the victim of a “political witch hunt” involving a cover-up and police collusion with fascist protesters. Friday County Court judge Michael Savage ruled the felony case against Felarca could proceed. Judge Savage did not accept the defense’s argument that the charges were discriminatory. “Simply nothing in these exhibits supports the defendants’ claims…that they were unjustly or unfairly culled out,” he said in court. The fighting broke out in June when about 30 members of the Traditionalist Worker Party were confronted by more than 300 counter-protesters. Fourteen people suffered stab wounds, cuts, and bruises. Two of the injured survived critical stab wounds. The CHP is seeking 68 felony charges and 514 misdemeanors against 106 individuals for activities ranging from unlawful assembly to assault with a deadly weapon. Officials said their investigation was made more difficult because many counter-demonstrators wore masks, forcing them to review surveillance and social media videos to identify the attackers. “Many of those deliberately disguised their identity and were difficult to locate. Many refused to cooperate with investigators,” CHP spokeswoman Fran Clader said. The Traditionalist Workers Party had a permit for the rally, and more than 100 officers were present because of the “expected” counter-protest. Several observers who were not involved criticized officers for being too slow to intervene. The police just stood by and let this escalate. That’s the same sort of hands-off policing that resulted in a death in Charlottesville. Police need to stop these fights the minute they start. Arrests will let others know this will not be tolerated. Above is the video showing Felarca attacking a member of the Traditional Worker’s Party. She shoves him, punches him and then her fellow Antifa goons take over, knocking him down to the ground before kicking and stomping him. The video also shows Felarca celebrating her group’s victory. I don’t understand how she is claiming this is a witch hunt. It’s clearly a crime caught on video. The news reported that a "Neo-Nazi" group caused trouble but that a group with a teacher in it was just defending themselves. The news forgot to mention the Traditional Workers Party, which they called Neo-Nazis, had a permit for the 30 people assembled and that the casual group defending themselves came armed with weapons, was 300 in number and was an Antifa group BAMN and did not have a permit. This woman is the poster child for everything that is anti-American. It is ironic that these ANTI-FA types claim others are the Fascists . When ANTI-FA mimics and performs just about every NAZI FASCISM Tactic. lock them up for decades to send a strong statement. Lock them all up. How did we get here? The Democrats have done nothing positive for for our country. I can't even comprehend why he denies the request. It's funny how the media manipulate everything..